Last month at Independence Hall in Tel Aviv, our guide off-handedly mentioned that if we wanted to read a great speech, we should read the speech Golda Meir gave in Chicago. Immediately, I Googled the speech. It was January of 1948 and the Jews in Palestine already were fighting neighboring Arabs on a regular basis. Convoys of cars going up to Jerusalem were being ambushed; skirmishes were breaking out all through the country. To help finance the fighting, David Ben-Gurion sent Golda Meir to the United States to raise funds from the American Jewish community, the strongest and wealthiest such community in the world. Although Ben-Gurion himself wanted to go, the executive council of the provisional government voted that Meir should go instead, leaving him to do the groundwork necessary to establish the Jewish State since the British would be leaving the country in a few months. Eliezer Kaplan, the treasurer of the Jewish Agency, had made an earlier trip to raise $7 million, but had failed in his mission. Meir was relatively unknown within the American Jewish community, but upon her arrival in New York – back in the U.S. for the first time since she had left Milwaukee years earlier to live in Israel – her sister, Clara, suggested she try to speak at the annual conference of the Council of Jewish Federations and Welfare Funds. The body would be meeting that weekend at the Sheraton Blackstone Hotel in Chicago. Friends… These young boys and girls, many in their teens, are bearing the burden of what is happening in the country with a spirit that no words can describe…. All we ask of Jews the world over, and mainly of the Jews in the United States, is to give us the possibility of going on with the struggle…. We are not a better breed; we are not the best Jews of the Jewish people. It so happened that we are there, and you are here. I am certain that if you were in Palestine and we were in the United States, you would be doing what we are doing there…. You cannot decide whether we should fight or not. We will.… That decision is taken. Nobody can change it. The next day, according to Steve Nasatir, president of the Chicago Federation, with whom I spoke recently, JUF Chicago leaders took out a loan for $5 million and handed it directly to Meir. Indeed, less than two months after Meir returned from the U.S., several hundred people gathered in Independence Hall in Tel Aviv to hear Ben-Gurion declare the establishment of the Jewish State on Friday, May 14, 1948. 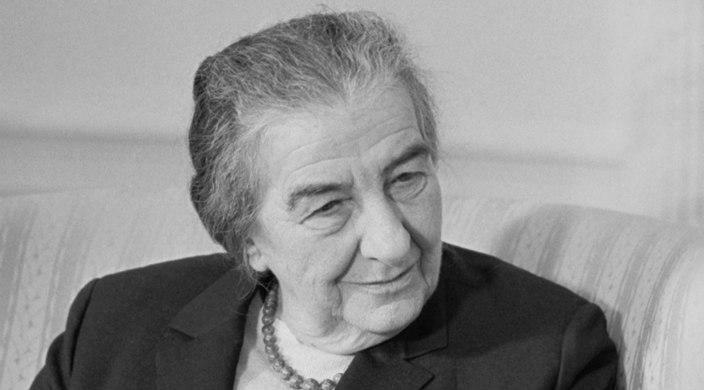 Among the 37 signers of Israel’s Declaration of Independence were only two women, one of whom, of course, was Golda Meir.